As a result of information derived from my travel experiences/interviews, I concluded that a mobile health application suitable for further research exploration and possible implementation in Kazakhstan would be the use of mobile ECG units in diagnosing Cardiovascular Disease. World Health Organization data suggests that 53% of deaths due to non-communicable (not contagious) disease in Kazakhstan occur due to Cardiovascular Disease (World Health Organization, 2011). Cardiovascular Disease is an umbrella term that is used to describe a number of different disease patterns, including Coronary Heart Disease, Hypertension and Stroke. Annual deaths due to Coronary Heart Disease (48,000) and Stroke (23,000) in Kazakhstan are great enough that Kazakhstan ranks 5 and 13 internationally for deaths due to these causes (World Life Statistics, 2010). Cardiovascular Disease (CVD) presents a unique set of challenges and opportunities for prevention and treatment in Kazakhsan where there exists an emphasis on tertiary care and a high level of specialization. The majority of the risk factors for CVD are lifestyle related, such as unhealthy diet, physical inactivity, and tobacco use for both Coronary Heart Disease and Stroke, making nation-wide prevention strategies difficult to implement. 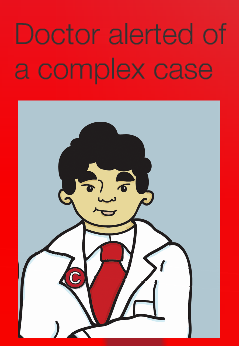 Kazakhstan’s health care system characterized by large hospital systems, overspecialization of physicians (Katsaga, Kulzhanov, Karanikolos, & Rechel, 2012), and central oversight by the Ministry of Health makes innovative strategies directed at preventing CVD challenging. Despite the focus on primary care that the 2005-2010 State Run Program of Healthcare Sector Reform and Development and the 2009 Code on People’s Health and the Healthcare System which specifies the “prioritization of prevention,” actual movement within the healthcare sector has been slow (Katsaga, Kulzhanov, Karanikolos, & Rechel, 2012). Beyond primary prevention of CVD through lifestyle changes, there are secondary and tertiary treatment options available for CVD; surgical approaches are available, but often the use of drugs such as ACE inhibitors, aspirin, beta-blockers, and lipid lowering medication can lower two year risk of acute illness by as much as 75%. However, here again, an emphasis on tertiary care and a high level of specialization present obstacles to early diagnosis and treatment. A re-distribution of labor from physicians to nurses and other primary care workers has only partially relieved the problem of physician overspecialization. Physician extenders (i.e., nurses, community health workers, technicians) play a much smaller role in medical practice compared to many of their international counterparts and are often restricted on care that they can provide. Despite a progressive policy aimed at establishing a profession similar to Physician Assistant in the United States, current roles within the system are unlikely to be changed in such a way that will directly help in treating CVD. In addition, the payment of these health care providers (along with that of physicians) lags behind regional averages, and the ratio of health workers per 100 000 population is on a decline (Katsaga, Kulzhanov, Karanikolos, & Rechel, 2012). All of these factors result in obstacles to access including long wait times at hospitals. Given these access concerns, diagnosing CVD can be problematic (i.e., correctly identifying the condition the patient is experiencing). It is often the case that patients experiencing symptoms of CVD would have stopped feeling the symptoms by the time they access healthcare in Kazakhstan where resources are stretched in hospitals and wait times are often long. An accurate diagnosis in CVD can often be made using an Electrocardiogram (ECG) to assess heart rhythm, which can then be used to structure a treatment. It often happens that when a patient feels the symptoms that signify an irregular heart rhythm, by the time they reach a hospital their heart beats as normal. However, a recent technological innovation has adapted small ECG units to be used in conjunction with Mobile (Lin, Wolf, Benjamin, & Belanger, 1995) (Governent of Kazakhstan) telephones, creating so-called “Mobile EKGs.” This provides an alternative to seeking a facility with an ECG when symptoms emerge, that is, the mobile ECG monitor can be carried around by individuals in whom CVD is suspected. The devices are easy to use. They are the size of a mobile phone and fit into a pocket or handbag. One can register his or her ECG by simply putting two thumbs on the device and holding them there for 30 seconds. By pressing the send button they can transfer the ECG reading over a cellular network to a doctor who can check the result as long as they are within the coverage area of the network. The units can be provided to patients by their physician to take with them to measure the ECG at exactly the right moment when they feel their symptoms. In many cases, the ECG will be normal and the symptoms probably caused by stress. In some cases, however, the ECG will show an abnormality requiring some form of treatment to protect the person from complications. Thus, the mobile-ECG holds the potential for early diagnosis and treatment of CVD, saving lives and reducing human suffering. In addition, loaning a mobile ECG unit to a patient can reduce the use of hospital resources in addition to enabling more accurate diagnoses. Implementing smartphone technology performs exactly this type of “leapfrogging.” The broader array of technologies that mobile ECG is a part of is called mHealth. Various mHealth applications have been used worldwide and their efficacy has been well documented. Mobile ECG in particular has been successfully used in environs as diverse as the Philippines, Sweden, Guatemala, and Norway, and has recently been approved for clinical use in the USA by the Federal Drug Administration (Mobile Health News, 2012). The “Compendium of new and emerging health technologies,” published by the World Health Organization, explains, “the system is a proprietary push delivery and review platform allowing remote review using the internet and cell phone network of ECG’s/medical images. Medical data is recorded at the point of care and then uploaded to the system’s server from which it is then delivered to a physician’s smartphone or PC. The transaction is fully traceable and secure.” Using smart phones eliminates slow, non-traceable systems such as faxes and paper mail, and offers concurrent modules for medical services, patient management, administration and finance. The mobile system can easily reach to any area that offers telecommunications access. The Kazakhstan Embassy’s page on infrastructure indicates that telecommunications developments from 2006-2008 resulted in a great number of cellular subscribers: ”87 per 100 citizens.” Therefore, the units can be used within existing systems. Hierarchical decision-making causes innovation in combatting CVD in Kazakhstan difficult. Most care is specified by the Ministry of Health under the Guaranteed Benefits Package. Doctors often look to the Ministry of Health first before trying any new treatment or procedure. Recognizing the importance of innovation, the government of Kazakhstan recently purchased the National Medical Holding, a large hospital system in Astana, in order to merge its functions with the academic and research mission of the newly built Nazarbayev University with internationally aware medical personnel, an emphasis on research, and national influence. The partnership will seek to implement various aspects of the Kazakhstani government’s goals in healthcare, including new diagnostics methods, adherence to international treatment standards, and clinical trials and research, and will serve as a model hospital for the rest of the country. The government of Kazakhstan’s investment in the National Medical Holding on behalf of Nazarbayev University proves the partnership actively seeks medical technology investment. A medical communication system that integrated smartphones certainly fulfills the second general strategic objective of the Holding: “to develop research and innovation activities and ensure efficient transfer of technologies to Kazakhstan’s public health system.” It would also further the first objective, especially for rural citizens: “to meet the patients’ demand for high-tech, quality and accessible medical services.” A research-oriented mission distinguishes Nazarbayev University and National Medical Holding as a good site for research. Also included in the full report are notes/observations from the various interviews conducted and a proposal for further research. For more the full protocol, send me an email at cjsantos@live.unc.edu. Following in the footsteps of my colleague Emin, I’d like to take the opportunity to give a bit of explanation regarding the function and workings of a mobile health platform. First things first, when I say “mobile health” or “mhealth” I don’t mean the use of mobile clinics. These are remarkable initiatives, but people are often confused when I bring up cell phones. mHealth refers to the next generation of “telemedicine” or “remote medicine,” and harnesses new technologies in the cellular industry to preform healthcare. Basically, it’s healthcare with cell phones. There are three main advantages to using a mHealth platform, the opportunity for home visits, telemedicine/telereferals, and training or continuous training for improvements. 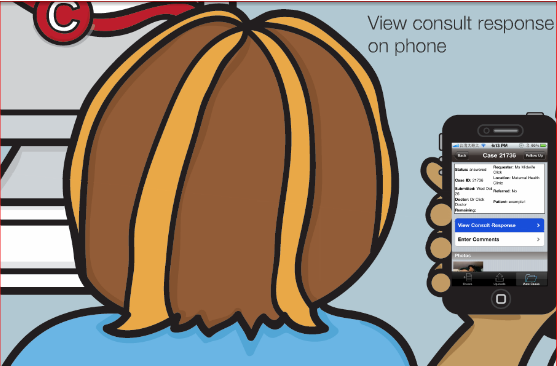 Using mHealth in home visits allow for many advantages. Cell phones equipped with mHealth technology allow a community health worker to take pictures to send to a specialist, refer to texts or auxillarly resources, and transmit patient information in a secured fashion. Home visitations themselves are great, it is often quite difficult for a person in need of constant medical care such as a pregnant mother or someone suffering from lifestyle related chronic diseases to travel to a clinic for routine treatment. It is more resource effective to utilize community health workers or local nurses to make home visitation than expensive specialists. Home visitations allow hospitals and other large institutions to monitor patients continuously and refer to specialists remotely for diagnostics when needed while still providing quality point-of-care treatment. Finally, home visitations coupled with mHealth allows local health worker resources to be leveraged, promoting a greater degree of trust and continuity of care between provider and patient. Telemedicine or telereferals in rural clinic or during field visits, health worker or nurse can use telemedicine kit to send patient symptoms info to remote doctors to eliminate unnecessary referrals and transport of patients. 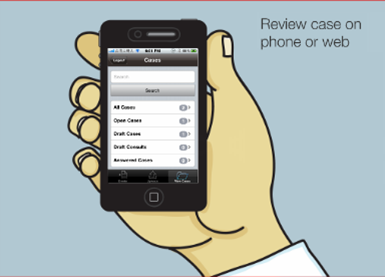 Doctors can review prior patient history with ease. Coupled with community health workers or local nurses, this practice enables point-of-care diagnostics capability and shortens time to treatment through remote consultation with physicians compared to physical referral into hospital systems. The use of mHealth for training is another often overlooked advantage to mHealth. Say a community has been identified as at risk for diabetes and all of it’s associated illnesses. 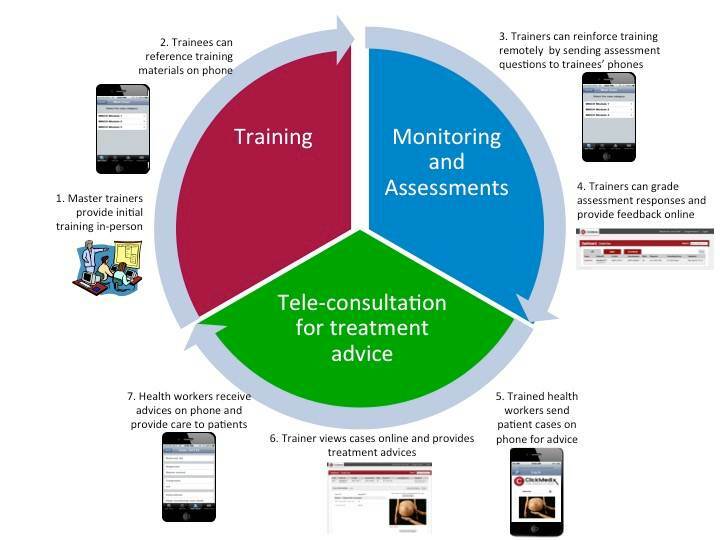 The following graphic illustrates how mHealth assists in the training of local, place-based community health workers. As you can see, a key advantage to mHealth is not only in training, but continuous training, ensuring a consistently high quality of care. For me the natural next question is what about HIPAA requirements? For those of you outside of the know, the Health Insurance Portability and Accountability Act is a 1996 law that regulates the use of electronic patient data. The aim is privacy, and information is subjected to a rigorous criterion of desensitization in order to comply. This means that any medical information on a patient, which is private, has to be unattached to any identifier for that patient, such as social security number or name and birthday. Wouldn’t mHealth and the free and open use of patient data open up a variety of HIPAA noncompliance issues? In fact not. I’ve spoken with Ting Shih of Clickmedix about this exact issue, and their comprehensive system has worked within the HIPAA regulations in the US and similar regulations abroad. Her company’s system takes data captured at point-of-care by primary care doctors or community health workers- data that is attached to a patient’s personal information- runs it through their system in order to desensitize it, and then sends it to the necessary hospitals or to worldwide network of specialists already collaborating on telehealth issues. Then, once the appropriate diagnosis is made, the data is then sent back to clickmedix, which re-attaches the diagnosis to the particular patient, and returns it to the community health workers. The entire process occurs within five minutes. Effective management of data in healthcare allow for significant returns to scale in healthcare delivery. Currently,Kazakhstan has no comprehensive mechanism for human resource management and planning that takes into account the distribution and allocation of staff to facilities. Strategic development of information management systems have the potential to alleviate this problem in the future. Public health professionals and planners will be able to organize resources for effectively as data collection improves. Further, providers are not immune to the data bug. In a recent presentation, I heard Dr. Brent Egan of Medical University South Carolina’s OQUIN network talk about the effect that quantitative data had on primary care physicians. Many physicians were initially reluctant to turn over patient data due to potential HIPPA violations and the increased workload it entailed. However, many were convinced when they could literally see the data organized in front of them in almost real time. Accurate and timely feedback enabled doctors to address patients problems on a macro level as they occurred. By extending the data collected through the Medical Information Centers to primary care providers in rural areas of Kazakhstan through cell phones and mHealth, physicians are likely to have a better on the ground response to health conditions. By making this a two way system, Medical Information Centers stand to benefit from the increased data collection that widespread mobile use can provide. This can help alleviate the shortfalls in personelle allocation that currently occur. Finally, the United States is not immune to this problem as well!